Spotify vs Pandora Music, An Indepth Analysis. Spotify and Pandora are two different music streaming services where music lover can go to stream music and listen to them later. With new services popping up on a daily basis, Spotify and Pandora are the two main players in music streaming. However, despite the fact that both of them are considered the main music streaming services, they are two different media with different features and services. If you want to discover more about the services and which one you can prefer, keep reading to find out the difference between the two music streaming services. 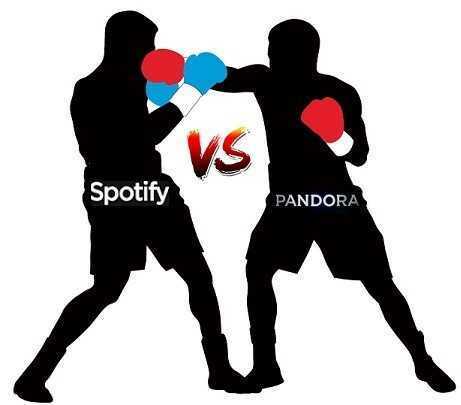 Spotify is considered to be more favored than Pandora. Spotify allows its users to search for the favorite songs by artist name, song name or playlist, whereas Pandora is more about discovering new songs. After finding your song on Spotify, you can stream it, and to your playlist to listen to it again or share it with friends. Spotify makes thing more similar to a personal music library rather than a radio station. Also, Spotify gives its users more options with its much bigger music library than Pandora. With over 20 million songs, users can create playlists based on their searches. It aims to replace traditional music players such as Windows media player to iTunes with streamable music. What sets Spotify apart from Pandora is the way it allows users to listen to whatever they want, anytime and anywhere they want. Spotify offers radio-like features just as Pandora, but its main selling point is that you can stream top 40 hottest songs and listen to your favorite album from start to finish. Users can search and stream particular songs as per their choice. You get to choose the specific songs you want to listen to. Spotify also has a good partnership with artists and record labels. The partnership allows users to stream songs every time the song is played. Playlist on Spotify works the same way it works on traditional music players. To create a playlist you manually add and remove songs from your playlist. The only difference between traditional media and Spotify playlist is that Spotify can be shared easily. This has made Spotify famous among music lovers who are looking for a free and legal way to share their favorite songs and artist with friends and family members. Spotify offers users free access, but they limit free users to only 10 hours so music per month. If you need more hours you need to upgrade to their premium service which is ad-free and gives you unlimited listening. To upgrade you need to pay $9.99 per month. Upgrading to Spotify Premium option give users the benefits of downloading music and listening offline with having to stream online. In an effort to get more subscribers, Spotify offers discounts for students as well as free one to three-month trials for Spotify Premium. The main strength of Pandora lies in discovering new types of music. The number of station combination is limited, but the channel refining tools are highly advanced. Compared to Spotify database of 30 million songs, Pandora doesn’t come anywhere near Spotify as it only holds a million songs. There are some other songs that you can be found in Pandora but have been withheld from Spotify by artists because of compensation issues. Artist like The Black Keys and Taylor Swift have withheld their music with Spotify but you can still find their music on Pandora. Many people love Pandora because they can use it to discover new music. Pandora constantly introduces people to new music where they can select their playlist based on songs, genre and multiple artists. As users go through each song, they are able to offer a thump up or down, which allows them to shape the station to their taste. Different from Spotify, Pandora offer users free services where they can stream music on their home-listening devices and mobiles phone and tablets. This type of services includes ads and limits a number of time users can skip music. If that is not a good plan for you, Pandora offers you the option of paid subscription on their Pandora one platform. The benefits of subscription include, removal of all ads and allow users to listen to what they love. While Spotify is flexible than Pandora, it is also more universal on the web than Pandora. Spotify can be found in many mobile devices and media player, but rarely on HDTVs. You can use Spotify connects to join Spotify with a set of speakers or other devices, which can then be controlled via a Spotify mobile app. Pandora is found a lot more on frequently on mobile devices and computers. It can be found on media players and HDTVs that carry default support for Pandora.